We developed a simple polynomial taper equation for poplars growing on former farmland in Sweden and also evaluated the performance of some well-known taper equations. In Sweden there is an increasing interest in the use of poplar. 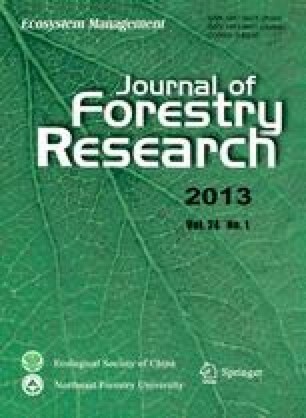 Effective management of poplar plantations for high yield production would be facilitated by taper equations providing better predictions of stem volume than currently available equations. In the study a polynomial stem taper equation with five parameters was established for individual poplar trees growing on former farmland. The outputs of the polynomial taper equation were compared with five published equations. Data for fitting the equations were collected from 69 poplar trees growing at 37 stands in central and southern Sweden (lat. 55–60° N). The mean age of the stands was 21 years (range 14–43), the mean density 984 stems·ha−1 (198–3,493), and the mean diameter at breast height (outside bark) 25 cm (range 12–40). To verify the tested equations, performance of accuracy and precision diameter predictions at seven points along the stem was closely analyzed. Statistics used for evaluation of the equations indicated that the variable exponent taper equation presented by Kozak (1988) performed best and can be recommended. The stem taper equation by Kozak (1988) recommended in the study is likely to be beneficial for optimising the efficiency and profitability of poplar plantation management. The constructed polynomial equation and the segmented equation presented by Max & Burkhart (1976) were second and third ranked. Due to the statistical complexity of Kozak’s equation, the constructed polynomial equation is alternatively recommended when a simple model is requested and larger bias is accepted. Foundation project: This work was financially supported by Skogssällskapet foundation.